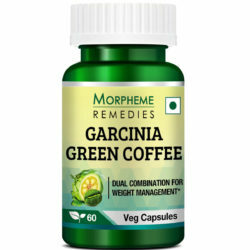 Morpheme Remedies Garcinia Green Coffee Supplement is a 100% natural product used for weight management . It helps in managing the weight of the body. The two major ingredients green coffee bean extract and garcinia cambogia extract comprise anti-obesity components that help in naturally controlling the weight in humans. 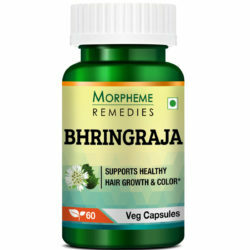 This product comprises of chlorogenic acid in a substantial amount. 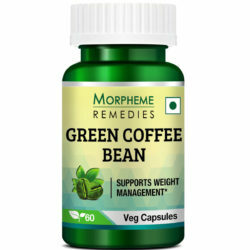 Morpheme Garcinia Green Coffee Veg Capsules is a fully natural product. The presence of chlorogenic acid helps in improving the overall lipid metabolism rate. One capsule before lunch and one capsule before dinner is the usual course but it’s better to consult a physician before using it. The presence of green coffee bean extract is a rich source of chlorogenic acid. The supplement also contains Garcinia Cambogia extracts which are a rich source of HCA. It helps in suppressing the appetite while controlling the enzymes responsible for fat production. 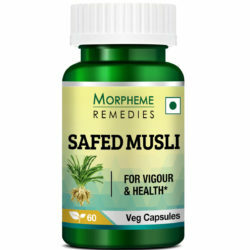 The supplement is available in the form of the capsule and helps in suppressing the appetite of those who fail to control their love for food. 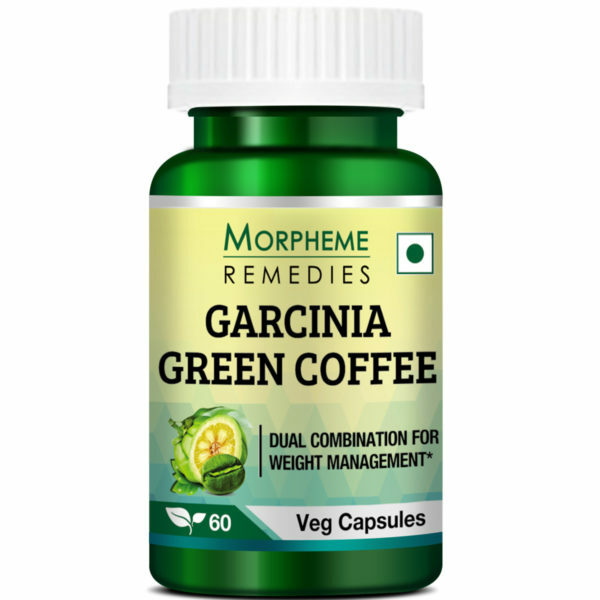 Is the Morpheme Remedies Garcinia Green Coffee Bean capsule safe to use? This capsule is 100% natural and prepared from natural extracts. There are no chemical components. It’s totally safe to use considering those who are worrying about side effects. Can the capsule help in weight loss? This is a 100% natural product that aids in weight loss. But you must understand that proper diet, correct workout plan, and the right amount of rest are equally important to achieve the desired figure of your dreams. Does the supplement contain any type of chemical components? No, the product is 100% natural and free of any impurities. The only ingredients used are Garcinia Cambogia extract and green coffee bean extract. Very good supplement for curbing appetite and increasing energy. It has encouraged me to stick to my weight loss routine. I found this supplement very helpful for suppressing appetite. It had helped me overcome the frequent hunger pangs. Now I feel full after eating a smaller meal. The ingredients in the supplement seem to act as metabolism booster, as it has helped me lose fat at a slightly faster rate though I am following the same exercise routine. This dietary supplement has helped in giving me relief from hunger pangs. It has also helped in burning fats. The combination of diet, exercise and garcinia green tea supplement has helped in reducing my waist circumference and body weight. I am excited to find a weight loss supplement that actually works as described. It has helped in giving me the energy I need to follow my workout routine without feeling tired. It helped in curbing appetite without causing any undesirable side effect. An effective weight loss supplement especially when overeating and low energy are problems. Eat healthy foods and exercise daily for best result. This supplement has helped in reducing my hunger. It seems to have boosted metabolism, as I am losing fats fast. Good for suppressing appetite and increasing metabolism. This product helped me in weight loss. It helped in reducing my hunger and restoring normal appetite. It has worked as a great aid for healthy dieting. This product is no gimmick. It actually works. I am impressed with the result. It helped in easing weight loss. Losing weight was not easy for me. My hunger increased with increase in physical activities and I could not lose weight. To curb hunger I started to take this supplement. The result was amazing. It helped in suppressing my appetite and also increased my energy. Gave me the extra energy I needed to break the weight loss plateau. The effect can be experienced in a short time. Skepticism kept me away from diet pills. But after seeing a friend’s weight loss success with this particular product, I thought of trying it. There was some increase in my energy level and I felt less hungry. Weight loss now seems to be faster. After taking it for two weeks, so far it has helped in curbing appetite and there seems to be some increase in energy. This is a good supplement for weight loss. It has helped in reducing my hunger. Now I only feel hungry when my body needs fuel. It has also given me the stamina to do workouts for a longer time. It helped in curbing appetite without side effects. I am taking it consistently for 3 weeks and have lost some weight. The combination of garcinia and green coffee bean has helped in reducing my body weight. I must admit that I am dieting and doing exercises, but this dietary supplement has helped in making these things easier for me. This product helps in beating hunger without any negative effect. It also seems to work as a metabolism booster. I am taking this garcinia and green coffee supplement for a short while. It is definitely helping in reducing my appetite and reducing fatigue. This is the right product for my diet and exercise routine. Garcinia-Green Coffee is an excellent supplement for weight loss. It is helping in boosting my energy level. My frequent cravings are now almost gone. I am feeling healthy, happy and losing weight at a faster speed. This is a good product. It helped in reducing my cravings. Though I am still following the same weight loss diet and exercise routine, I am losing weight faster. It seems to help in weight loss. It has worked in suppressing appetite. This product has been useful in controlling appetite. After I started taking it, I can exercise longer without feeling tired. A good metabolism booster. This is a wonderful product for curbing cravings and increasing energy and metabolism. This is a good appetite suppressant. It helped boost weight loss. This is an effective metabolism booster. I found this product helpful in reaching my weight loss goal. This product helped me in reducing my calorie consumption. There was no side effect. I was able to exercise for a longer time after taking this product. Garcinia-green coffee is a useful product for people trying to get rid of the body fat. It has worked for me as an effective appetite suppressant and helps in breaking down fats. I am feeling energized and healthy after taking it. Instead of taking garcinia and green coffee bean supplements separately, I took this product as it contains both. It has worked as a safe appetite suppressant. It supports metabolism. A good product for weight loss. Helped in reducing hunger and body weight. This supplement has helped me in overcoming cravings and excessive hunger. It is helping in manage fats at a faster rate by exercising. This supplement has helped in inducing fat metabolism. I am losing more fats after I started taking this supplement. This is a safe product for weight management. It made me eat less without feeling hungry, reduced fatigue and stopped further weight gain. This supplement has been quite effective in reducing hunger without side effects. It has helped in energizing me. It seems to help in improving metabolism. This dietary supplement has helped in controlling appetite. I can easily follow a calorie restricted diet without feeling hungry. It is helping in breaking down the fats. 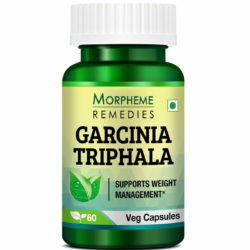 This supplement helps in weight management without harmful side effect. It helps in maintaining normal appetite by improving satiety and reducing overeating. It seems to have helped in speeding up weight loss. This is a good supplement for healthy weight management. It helps control appetite. Helped me in overcoming my unhealthy overeating habit. It is helping in burning fats. This supplement has helped in suppressing hunger. It has helped me in eating calorie restricted meals without feeling hungry or exhausted. This is a good supplement for losing fats. This supplement has made it easy for me to diet, exercise and lose weight. 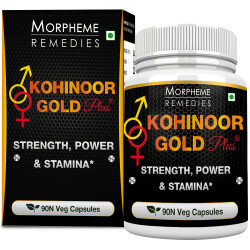 It helped in suppressing excess hunger and revved up fat metabolism and energy production. This product has been effective in suppressing hunger and decreasing the fats. Its metabolism boosting effect helped in faster weight loss with diet and exercise. This supplement has been effective in reducing my hunger pangs and helped restore normal healthy eating. I feel healthy, energetic and experiencing faster weight loss. 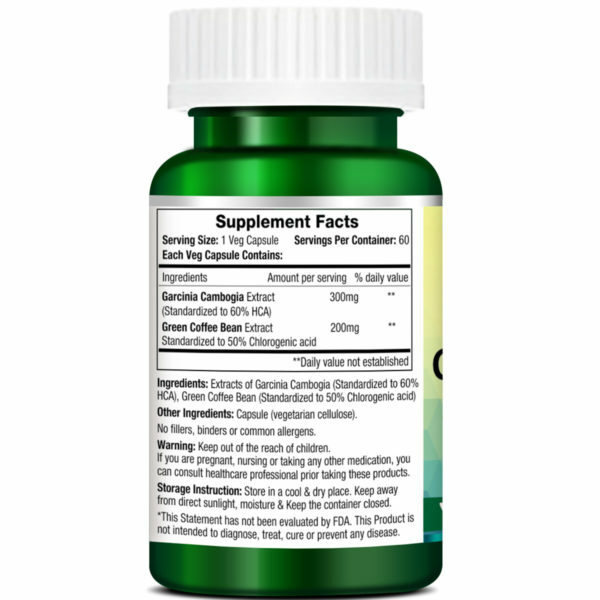 This supplement has helped in stopping overeating and speeding-up weight loss. My dieting and workout schedule became more effective after I started taking this garcinia-green coffee supplement. 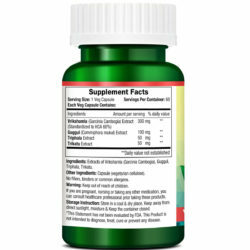 This supplement has helped in suppressing appetite. It seems to have helped in speeding up weight loss. This dietary supplement has been effective in reducing my hunger. I feel full and satisfied by eating small meals. It has given me the energy to exercise and lose weight fast. This is a good supplement for suppressing appetite and stimulating faster metabolism. It has helped me. This is a good appetite suppressant. It is helping me in losing weight. This is an excellent supplement. I am taking this for about 3 months. It makes me feel full fast. It is supporting faster metabolism. This product has helped in speeding up weight loss. Dieting has become easier for me as this supplement has helped in suppressing hunger. It has helped in boosting metabolism and increased energy. I’m taking this supplement following my fitness instructor’s advice. It has helped in suppressing my appetite without adverse side effect. My exercising capacity has improved. This product helped kick start weight loss. It helped reduce overeating. It seems to have worked as metabolism booster. This product has helped in reigning in my appetite. Now I can easily control my munchies. It has boosted my energy level and helping in breaking down the fats. For controlling appetite and increasing metabolism for weight loss, I am taking this product. It is helping me. A good product. It has helped reduce excess hunger. I feel energetic. It is promoting fat loss. Controlling appetite and burning fats have become easier after I started taking this product. I’m feeling healthy and steadily approaching my target body weight. A good supplement that helped in easing weight loss. I am eating less and burning fats fast with the help of this product in addition to dieting and workouts. I feel less hungry and have more energy after taking this supplement. It is helping me lose weight. With the help of the supplement along with dieting and exercises I am almost close to my target weight. This supplement had helped in curbing hunger and boosted energy. After taking this supplement I rarely experience cravings for sweets and unhealthy food. It has been effective in suppressing appetite. My energy level is higher and the belly fats are slowly breaking down. As controlling appetite is essential for weight loss, I started taking this product. Within a week I started experiencing its effect. I feel less hungry and my mood has also improved. I feel energetic. Without the help of this product it would not have been easy for me to reach my target weight. This product is an excellent appetite suppressant. It helped in boosting my energy level and work capacity. This product is assisting in faster weight loss. I feel much better. It helped suppress hunger and is helping in breaking down the belly fats. This product has helped in controlling my hunger. I feel less hungry and my satiety has improved. It helped in making me energetic and assisting in burning fats. This is a helpful supplement. It helped boost energy and suppress excess hunger. Helping in weight loss. Garcinia and green coffee are both known for their anti-obesity effect. I needed to lose 20 kilos, so I started taking this product in addition to dieting and exercises. This product helped in suppressing hunger and is supporting faster weight loss. This product is helping in faster weight loss. It helped in controlling appetite and eating less without feeling hungry or tired. A good fat burner. This product is helping in breaking down the body fats. It is a safe and effective appetite suppressant. It is helping in keeping me energized for workouts. I’m satisfied with this product. By suppressing appetite it is helping me in dieting. My energy level is higher. This product has given my metabolism a boost. I feel energetic and less hungry after taking this product. This is helping me in losing weight. This product is helping me in getting rid of the extra fat. It helped curb excess hunger. Feeling energetic and my metabolism seems to have increased. After taking it, my exercising capacity has improved. This is a helpful product for weight loss. It provides that extra help that helps one lose weight with ease. After taking it I feel less hungry and more energetic. It is a good metabolism booster. This product is helping me in getting rid of the excess body fats. It is a safe appetite suppressant. It helped improve my mood and energy so that I can work harder and burn fats fast. This product helped me in controlling appetite and lose weight. It is helping in faster weight loss. Feeling energetic and healthy! This supplement helps me in controlling hunger. I feel full fast and eat less. I’m losing weight. It is a useful product for healthy weight loss. This product helped stimulate faster weight loss. It helped reduce the hunger. Now I feel satisfied after eating small meals. It also helped increase energy and improved mood. It takes time to lose fat. Eating calorie restricted meal and exercising were not easy for me. After I started taking this product, my hunger decreased. It helped speed up fat burning and reduced workout fatigue. This product is helping in getting rid of the fats that had accumulated in my body over several years. With the help of this product, along with diet and exercise I lost about 10 kilos in 3 months. This product has been of immense help in reducing hunger and stimulating metabolism. This helps in decreasing excess hunger. A good energy booster. Helping in weight loss. Two excellent anti-obesity ingredients are crammed in this product. It helps in burning fats. A good appetite suppressant. Helped improve the effect of exercise. This product blends garcinia and green coffee bean extracts. This combination helped in suppressing appetite and boosting metabolism. I take this daily. It is working as intended. I can see this product is working for me. It has worked in suppressing cravings and induced faster weight loss. This is good supplement. Helped curb excess hunger. This supplement supports weight loss. It helped reduce excess hunger. I feel better and more energetic. This product helped me stop overeating. I feel energetic. It seems to have helped in faster weight loss. This is good for suppressing hunger. Seems to have helped in increasing energy. This is good for reducing hunger. Assisting in weight loss. This is good for decreasing excess hunger that helped me eat less. I feel lighter and energetic and can exercise easily. A good product for healthy weight management. Curbing cravings has become easier after I started taking this product. Now my hunger is easily satiated after eating smaller portions. This is helping in weight management. This product supports weight loss. It eased dieting. I hardly feel the urge to overeat and feel full fast. Can exercise harder. This product is good for controlling appetite. If you are finding it hard to control excess hunger, this is the right product for you. I found this really useful for suppressing appetite. It is safe. I feel energetic after taking it. A quality product for boosting the weight loss effort. It helped in reducing appetite and good for energy. Dieting and exercising have become easy and effective. Taking this for suppressing hunger and it is working. My energy level has increased. Can work harder. Helping in weight loss.. This is quite effective in curbing cravings. Helping me in eating less. My energy level is higher. This worked as a good appetite suppressant. Helped in improving metabolism. An effective weight loss supplement. helped boost the effect of diet and exercise. I’m experiencing faster weight loss by taking this supplement. It helped suppress appetite. It appears to be a good metabolism booster. I found this an useful product for decreasing hunger. An effective metabolism booster. Helping in faster weight loss. This supplement gives me energy and reduces hunger. Works very well at the early stage of weight loss. This supplement has worked as an effective appetite suppressant without any harmful side effect. I’m satisfied with the result. It keeps me energetic and helped boost energy level. This product helped speed up weight loss by suppressing appetite. It appears to work as a metabolism booster. This product is a useful weight loss supplement. It is especially effective in suppressing appetite. I also feel my energy level has increased and I can exercise longer. 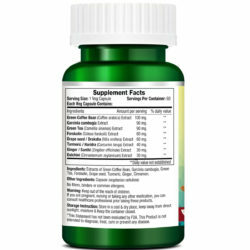 This supplement contains two important natural anti-obesity ingredients – garcinia and green coffee bean. It saved me the hassle of taking these two products separately. It helps in reducing hunger, elevates energy level and supports fat burning. Helping in suppressing appetite and burning fats. Using this with diet and exercise regimen, which is now easy to follow. This product is a good appetite suppressant. A good product for healthy weight loss. After taking this garcinia-green coffee supplement I feel full fast. I rarely feel the urge to overeat. Energy level is high. This is helping in weight loss. Other Ingredients: Capsule(Vegetarian Cellulose), No Fillers, binders or common Allergens. Directions: You can use the capsule as instructed in the label (i.e. one capsule half an hour before meals 1-3 times a day) or consult a physician and use accordingly. In order to achieve desired results, make sure you drink plenty of water, eat healthy diet, and exercise regularly.